The state canvassing committee meets in Montpelier Wednesday to certify the 2014 election results. Republican gubernatorial candidate Scott Milne confirmed Wednesday afternoon that he will not seek a recount of ballots cast in last week’s razor-thin election. Milne’s decision came hours after the statewide election canvassing committee met in Montpelier to certify the results. The group, which consists of Secretary of State Jim Condos and representatives of Vermont’s four major parties, confirmed that two-term Democratic Gov. Peter Shumlin won 89,509 votes, Milne won 87,075 and Libertarian Dan Feliciano won 8,428. Like any candidate who comes within two percentage points of the top vote-getter, Milne was entitled to request a recount by the end of the day Wednesday. But the Pomfret Republican said he had come to the conclusion that the cost of a recount was “not warranted” and that it would be “unlikely” to show that he won a plurality of votes. Even after the canvassing committee approved the results, the matter of who will lead the state for the next two years remained unsettled. In the event that no gubernatorial candidate wins a majority of the vote, Vermont’s constitution instructs a joint session of the House and Senate to name a governor from among the top three vote-getters. Milne has hinted in public statements in the past week that he may ask legislators to buck tradition and choose him instead of Shumlin, arguing that he won a plurality in many legislative districts. 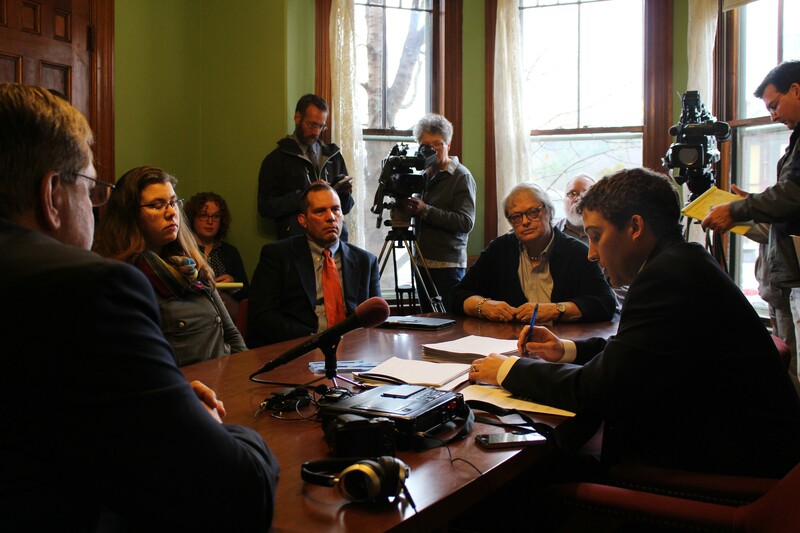 At a press conference Wednesday morning at his Montpelier office, Shumlin said it was up to Milne to take the next step. Click here for the full canvassing committee report.